Knee swelling is a common issue that can be caused by a number injuries or conditions. 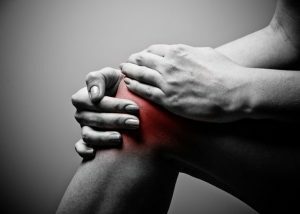 Within this blog I’ll be discussing the 5 common causes of knee swelling. I’ll start by quickly talking about what swelling is… So, swelling is one of the bodies acute reactions to damaged tissue, which usually lasts for a few days. Inflammatory proteins and fluid (swelling) are released into the damaged area to prevent spread of infection and to begin the healing process. This is an essential part of recovery but excessive swelling can cause joint stiffness so we work towards trying to reduce swelling naturally. Osteoarthritis is a common degenerative condition that develops as a result of ageing and general wear & tear throughout the years. 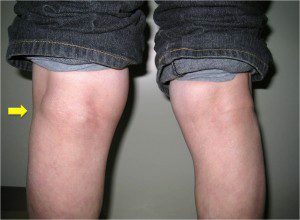 It is a common problem at the knees due to the constant weight-bearing nature of the joint. Arthritis targets the cartilage and causes degeneration which leads to a reduction in joint space and increase of bone on bone activity. People that suffer from arthritis typically have symptoms of pain, swelling, joint crepitus (creaky joints), and joint stiffness. Swelling is more common in an arthritic knee than a healthy knee because there is already damage at the knee and it requires less aggravation to trigger an acute swelling response. 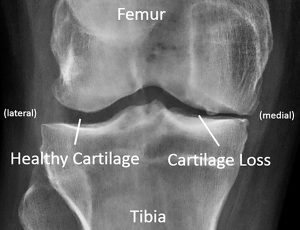 The swelling in an arthritic knee is usually a result of acute flare ups by performing unaccustomed activity or trauma at the knee. ACL tears are most common in a sporting environment as they are associated with landing, pivoting, and sudden deceleration movements. If you suffered an ACL tear you’d certainly know about it, they are extremely painful initially, and you would be unable to continue activity. There is a delayed swelling response with an ACL tear, swelling usually develops 1 hour post injury and it’s common for there to be a lot of swelling present due to blood from the injury also collecting within the knee. If you suspect an ACL tear then you should seek an assessment by an injury specialist. 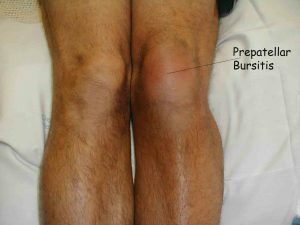 Inflammation of this bursa is referred to as, Housemaid’s knee because it is associated with those that kneel a lot. Repetitive compression of the bursa causes swelling on the front of the knee, and pain on movement or kneeling. Bursitis normally resolves with self management, or for more severe and rare cases when pain and swelling fail to subside, aspiration would be used to drain the fluid from the bursa. A meniscus tear is also most common in a sporting environment as it is a result of a sudden or excessive twisting motion. The symptoms associated with the meniscus tear depend on the severity of the tear present. A small tear may produce limited pain and swelling and recovers relatively quickly. However, a larger tear is associated with a tearing sensation, potential locking of the knee (due to floating debris in the knee), and immediate pain and swelling. If you suspect a meniscus tear then it would be recommended to seek an advice from an injury specialist. A Baker’s cyst is defined as, a synovial fluid filled mass located in the back of the knee. This commonly effects children aged 4-7 years old and adults 35-70 years old. In children, the cyst is often completely pain free and resolves spontaneously. However, in adults it’s often a result of another injury e.g. meniscus tear, ACL tear, and arthritis. The Baker’s cyst can be observed when standing with legs straight, excessive swelling will be present at the back of the knee and tenderness to touch. Initial treatment of the Baker’s cyst is to address the associated injury (meniscus, ACL, arthritis), and if the cyst doesn’t subside, aspiration can be used to drain the fluid.